So we've lost our AAA rating - the prize by which George dared his critics to judge his economic policy. Blame Labour. Blame Nick Clegg. Blame the snow, blame the rain, blame the leaves. It's too hot, it's too cold, blame the disabled, blame the unemployed, blame the shirkers,blame the fecund, blame the civil servants, blame the Euro, blame the immigrants, blame the teachers, blame the nurses, blame the poor. Go on. 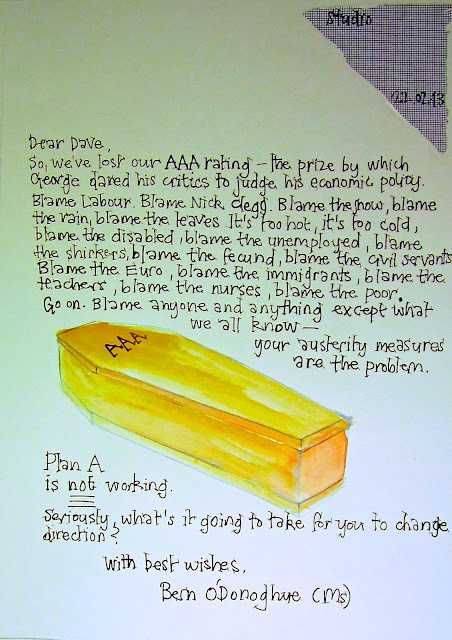 Blame anyone and anything except what we all know - your austerity measures are the problem. Plan A is not working. Seriously, what's it going to take for you to change direction?